The fascination with Madmen is simple, effortlessly cool, timeless style. It’s no surprise that everyone, including celebrities, are walking down the aisle in sheer midcentury style! I designed a retro inspired invitation on Minted, vote for it now! You’ll need to start with lots of pearls, birdcage fascinators, and heirloom broaches! Scour your local vintage shop to find authentic pieces and great deals. If you’re looking for your “something new” Anthropologie’s new bridal line, BHLDN, offers some great retro inspired items under $2000! You can also shop my favorite Project Runway designer, Kenley Collins, for some fresh, retro designs! A Madman Wedding can’t be complete without a full bar! Try some adult milkshakes, complete with two straws for the happy couple! Don would be very disappointed if you forgot the scotch, whiskey, or martinis! 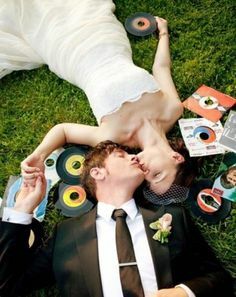 Reporpous inexpensive records as place cards and table number signs! These also make great props! Remember to have fun & invite me!! Midcentury Wedding fit for a Madman! board by JaxRobyn.